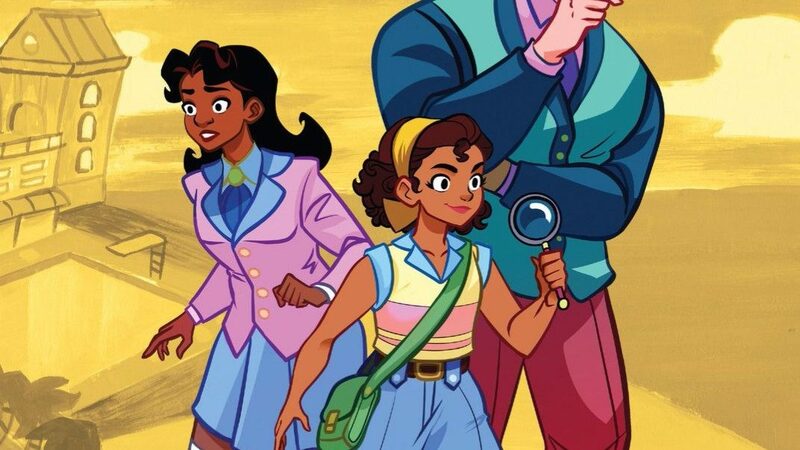 This week’s minorities in cartoons entry is “Goldie Vance,” a comic series by Hope Larson and Brittney Williams. The series is published by Boom! Studios, and debuted in 2016. Hope Larson is the writer of several other comic series, including “Batgirl” for DC Comics. Brittney Williams is an artist who works on Marvel’s “Patsy Walker, AKA Hellcat!” and other series. Goldie is a teenage girl who lives at the hotel with her father, the hotel’s manager. Goldie’s parents are divorced; her mother lives elsewhere in town, where she works as a costumed “live mermaid” in a nightclub. Goldie hopes to become the hotel’s resident detective. Akin to Nancy Drew, Goldie tries to help out the hotel guests and staff with mysteries that arise. The stories reflect early 1960s pop culture. The cars have tail fins, and there’s a record shop selling early 60s rock music. Meanwhile, the front desk clerk finds astronaut John Glenn (the first American to orbit the Earth) handsome. There’s also references to drag racing and the Cold War. “Goldie Vance” was originally a four-issue miniseries. However, it became a monthly ongoing thanks to initial popularity.